FeastHome – Blue is one of the famous color in interior design. It is a flexible color including if you want to apply it for a kitchen. 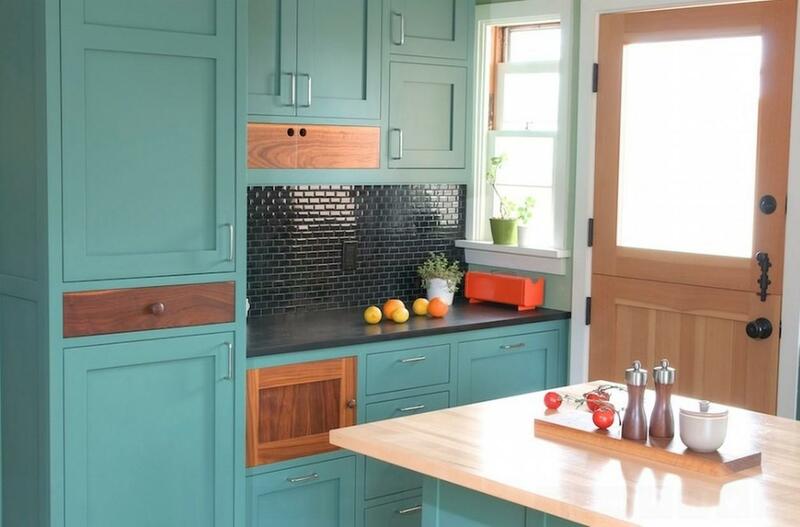 Check the list of 10 blue kitchen color schemes here first if you have a plan to remodel your old-fashioned kitchen into a fresher kitchen. The ideas here are easy to apply and you will be satisfied with the result. 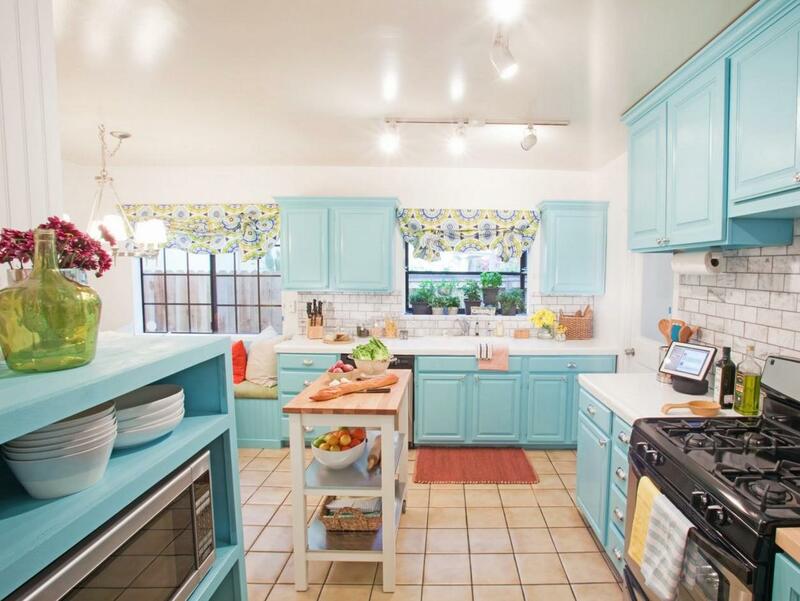 If you want to create a brighter kitchen, it will be great to apply a soft blue color. You can apply the soft blue for the base and the hanging kitchen cabinets. Then, combine it with different brighter colors such as white for the wall, pastel for the kitchen table, and many more. It is also important to choose bright tiles for the floor and cream will everything looks balanced. You may add pattern to make the kitchen looks cute and floral curtain is the best option. It is okay to use some darker items such as the stove and kitchen mat. Open the window to get natural light and it doesn’t matter if you have to close the window as long as you are installing some small bulbs there. Having a small kitchen doesn’t mean that you can’t do anything including giving a touch of blue in that area. Let say, you have a wooden kitchen similar to the image above. It seems impossible to give the touch of blue there, right? But don’t forget, you still have the wall and you just need to use blue wall tile. The brick wall tile model is a good option to give a simple pattern in the kitchen. 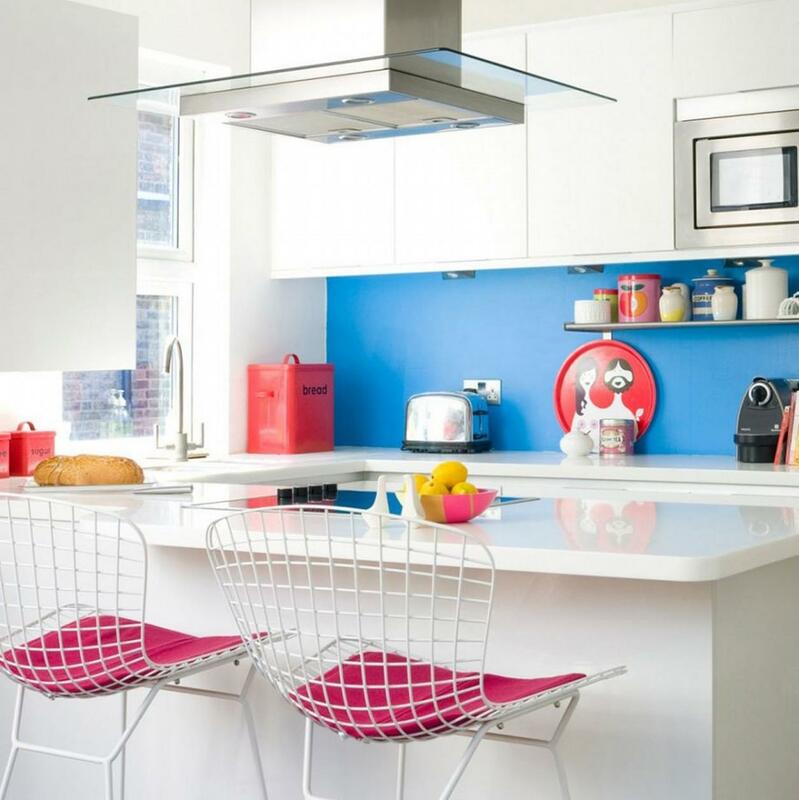 You can also put blue stools or contemporary kitchen chairs. Now, you have a kitchen with the touch of blue. Indeed, it makes you want to cook right away. Do you like blue and white? Why don’t you combine these two colors in your kitchen? 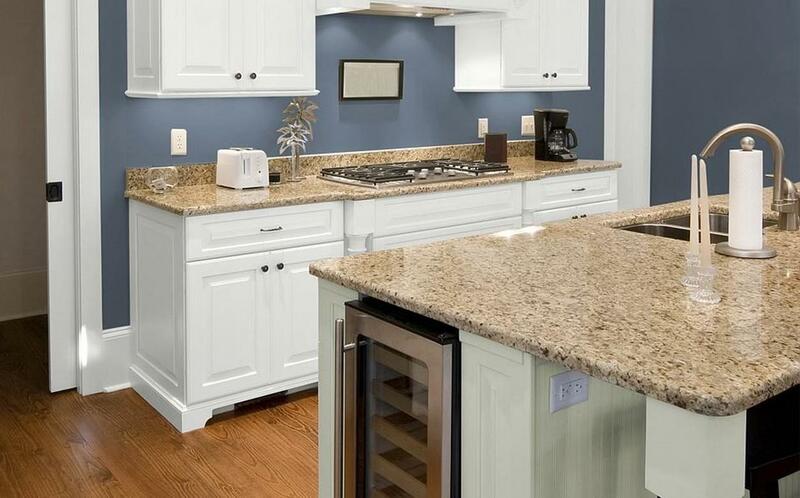 If you don’t want to lose the natural and the softness of the color, you may apply the white color for the base kitchen cabinets and the hanging cabinets. Then, you can consider painting the wall and ceiling with the soft blue. 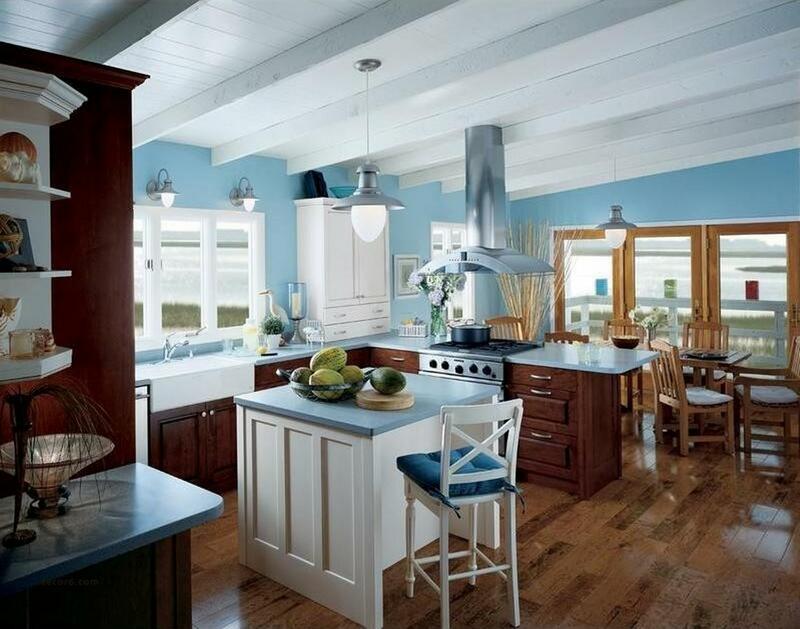 If the focus is to make a soft color kitchen, just choose the softest blue color and apply it. That’s it! Choosing a black ceramic kitchen sink will make your kitchen a little bit shiny. This kitchen idea is also a solution for those who have a very small kitchen at home. Dark blue lovers can also apply their favorite color for the kitchen. You don’t have to apply too much dark blue otherwise your kitchen looks full and uncomfortable. Just choose the best wall in the kitchen and paint it with a dark blue color. Is it enough? Yes, then choose a neutral color such as white to balance the kitchen. That’s why installing white hanging cabinets, a U-shaped white table, and using white modern stools is a brilliant idea. You may add some dark colors such as red, yellow, and black. The key is putting all the dark colors in balance and soon you will have a fascinating kitchen. For those who have a small kitchen which closes to the beach, you can try to design the kitchen inspired by a deck of a luxury boat. Here, you need to apply wooden furniture including wooden tiles for the floor. You may apply it for the base cabinet and the frame of the doors or windows. Combine it with white, especially for the kitchen sink, hanging cabinet, and the ceiling. So, where do you have to put the blue color? Just use soft blue and apply it to the wall and the kitchen tables. Try not to cover the glass windows with curtain and you will get an outstanding natural painting from the real beach scenery out there. Dark blue can also be used to create a luxury kitchen. The most important thing is the way you mix and match the colors. 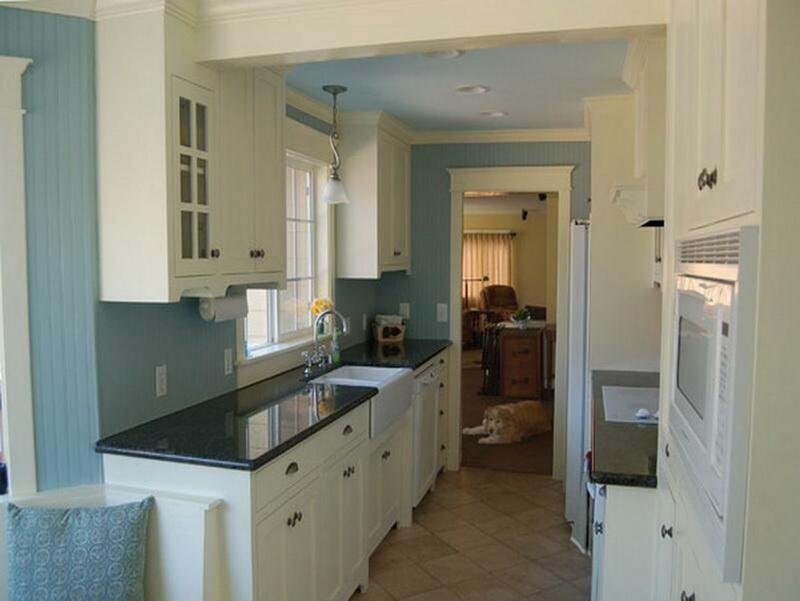 Just like the picture above, the dark blue is applied to the base and hanging cabinets. Then, it is mixed with ceramic kitchen sink which also has a little bit of blue color in the pattern. It is also okay to apply stones design wall tile to show a little bit texture on the kitchen. The high-quality wooden tiles for the floor boosts the glamourous sensation of the kitchen. You may also add some gold accessories or lights to make it more luxury. Now, you have a luxury blue kitchen at home as the place to cook anything for your lovely family. Can you imagine if you have a kitchen with plain colors? It is possible to apply for a small kitchen because the pattern and texture make the kitchen looks crowded sometimes. A plain soft blue is also a solution for this type of kitchen. It is better to use a large kitchen cabinet along with several drawers so you don’t have to install too many items. 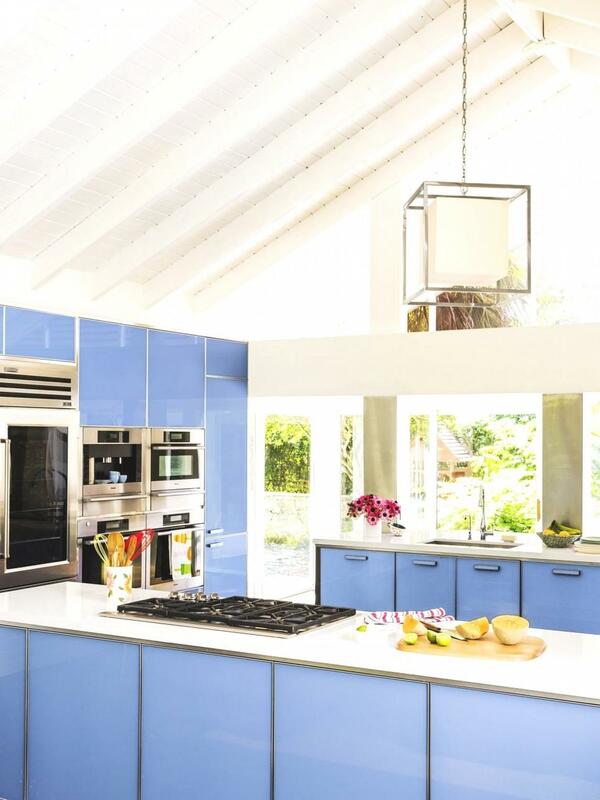 Just mix the blue kitchen cabinet with natural color such as wooden color, pastel, white, orange, yellow, or even black. The black wall tile helps to separate the area clearly. You don’t need to install curtains for the windows or door because you will get natural light from it. Wall tile is a cool material for some people. 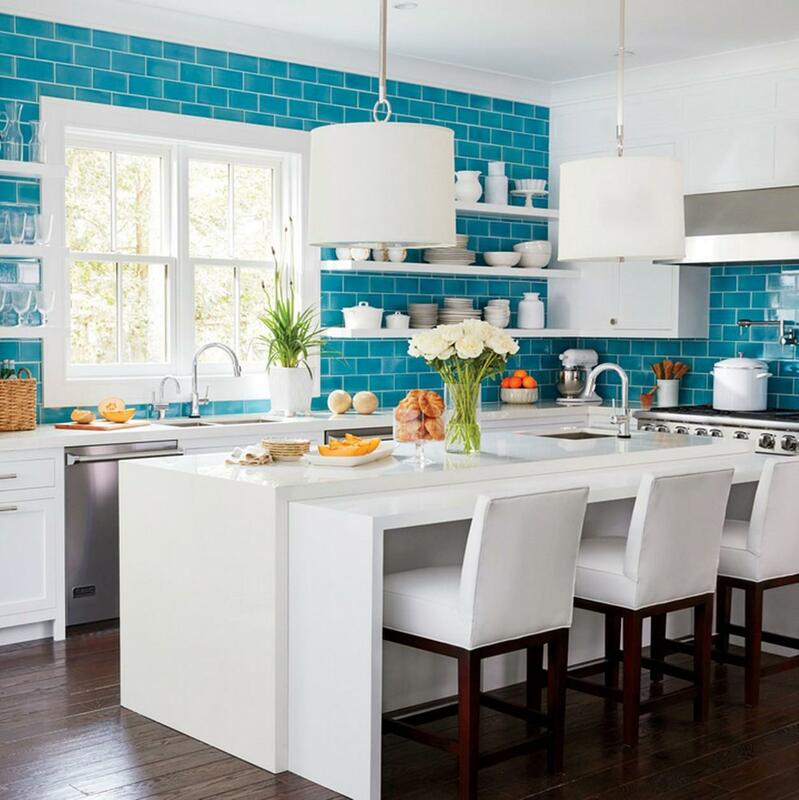 If you think the same, you may use blue wall tile to remodel your old kitchen into a fresher kitchen. Just cover up all the wall with light blue brick wall tile model. Then, use a wooden tile model to get the natural dark color. Now, you need white for the kitchen furniture, utensils, and accessories. For example, you may add a white base cabinet, kitchen table, parsons chairs, and even for the plates or pans. Putting some flowers or plants are also a good idea to do. By applying this design, you will have a clean and fresh kitchen which makes you want to stay there a little bit longer. It is also possible to mix the blue with different of color to make it a little bit purple. This color creates a warm sensation and makes you relax. Use the color for the wall and combine it with some neutral colors, especially white. White is always perfect for the kitchen cabinets whether the base or the hanging one. Marble kitchen sink is also a perfect option to give a little bit texture in the kitchen. Just like the white color, the wooden floor is also a flexible material which you can apply in any kind of theme including this contemporary kitchen model. If you don’t want to paint anything in the kitchen but you still want to create a kitchen with blue color, just try to choose the best cabinets. The best solution is putting a large base kitchen cabinet with some drawers. Just do the same thing if you want to add a hanging cabinet. Add it with a white kitchen sink to create a clean kitchen. It is great if you use stainless steel kitchen utensils because it creates great combination naturally. 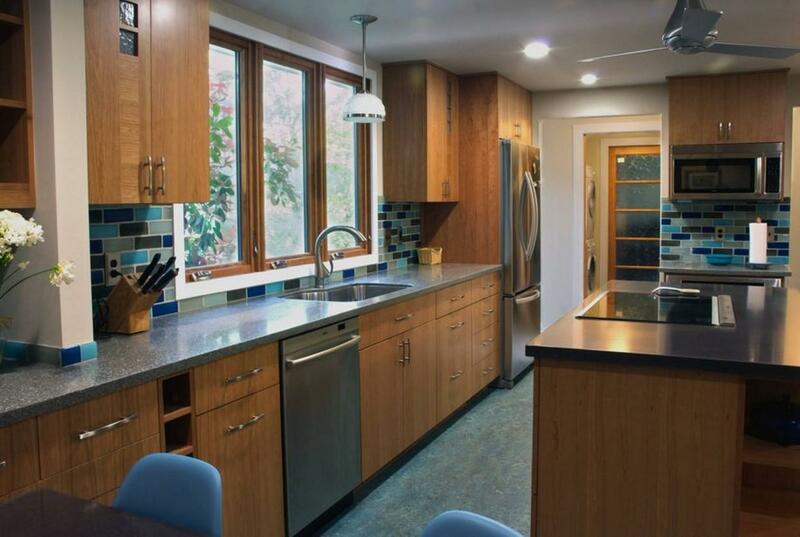 As the result, you can really remodel your kitchen in the simplest way and you can use the kitchen right away. Absolutely, those examples are a great inspiration for those who want to create a kitchen with blue color. 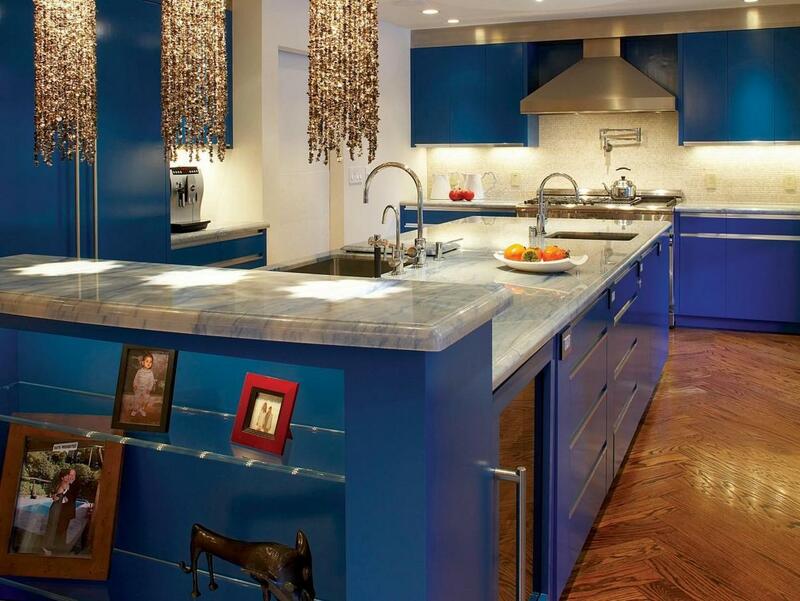 Different type of blue will create a different ambient for the kitchen. All of them looks cool, right? 10 EZ Ways to Decorate Your Kitchen!